After losing the rights to Oswald the Lucky Rabbit, one would think that Walt Disney would be very unlucky. However, on the train ride back to Los Angeles, Walt would create one of the most beloved animated characters of all time — Mickey Mouse. 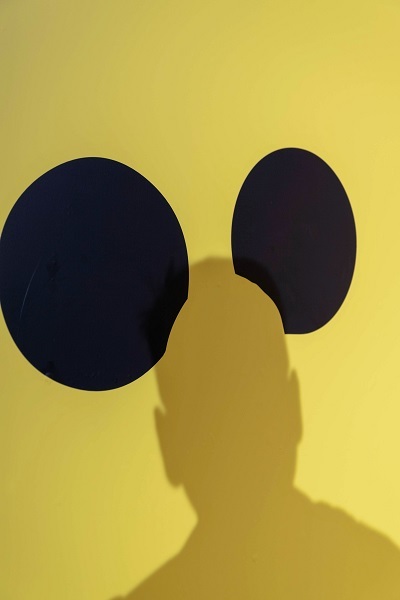 With his round black ears, red pants, white gloves, and yellow shoes, Mickey is instantly recognizable. 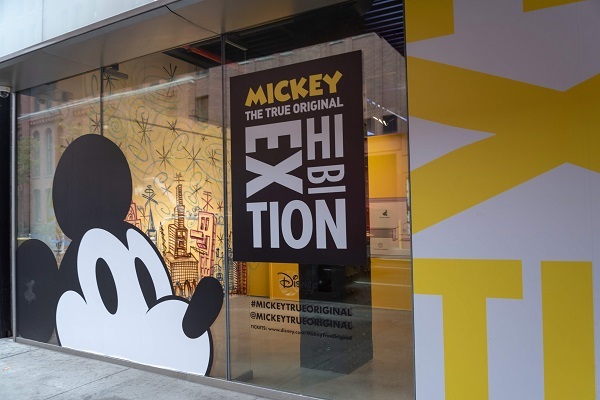 Now, to celebrate his 90th anniversary, more than a dozen contemporary artists have interpreted this iconic mouse in varied mediums, formats, and points of view in “Mickey: The True Original Exhibition,” at 60 10th Avenue in New York City, through February 10, 2019. Approaching the southeast corner of 15th Street and 10th Avenue one cannot miss the exhibition space. 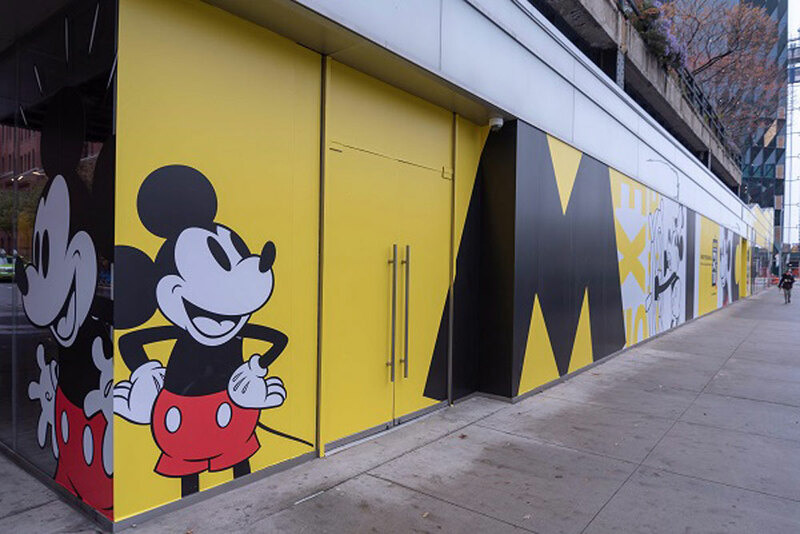 Floor-to-ceiling glass walls are covered in Mickey’s iconic four colors, with large graphics of this famous mouse surrounding the building. 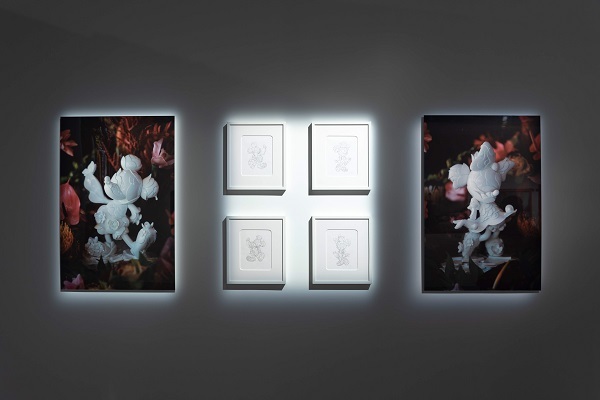 Artists include Tanya Aguiniga, Stacey Aoyama, Daniel Arsham, Katherine Bernhardt, Michael Bosanko, Brian Bress, Oliver Clegg, James Fauntleroy, Keith Haring, James Jean, London Kaye, Michael John Kelly, Tetsuya Nomura, Ariana Papademetropoulos, Oliver Payne, PEACEMINUSONE, John T. Quinn, Ranki, Brian Roettinger, DRx Romanelli (Darren Romanelli), Amanda Ross-Ho, Javier Sanchez-Medina, Kenny Scharf, Jeff Shelly, Shinique Smith, Keiichi Tanaami, and Tseng Kwong Chi. 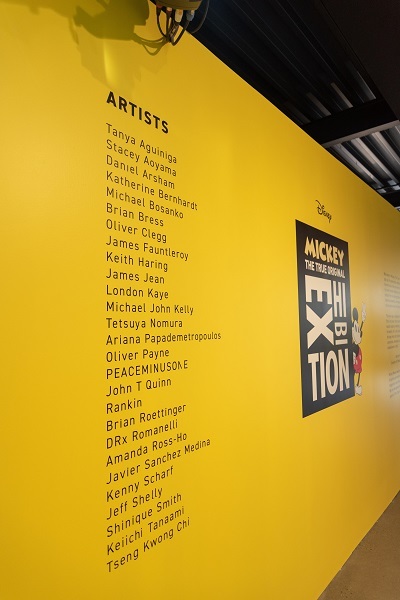 Although not exactly laid out chronologically, this 16,000 square-foot exhibition pays homage to Mickey through a series of 14 distinct galleries — Welcome Room, Hello Mickey!, Iconic Design, Oh Boy! 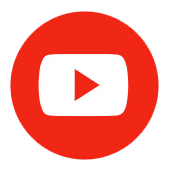 It’s Black & White, Ink & Paint, Burst Into Color, Sorcerer’s Hat, Mickey Mouse Club, 1928 Original Muse, The Collection, Mickey’s Game Show Live, Lounge, Cosmic Cavern, and Mickey’s Maker Show. You know you’re in for a special treat right from entering the building. 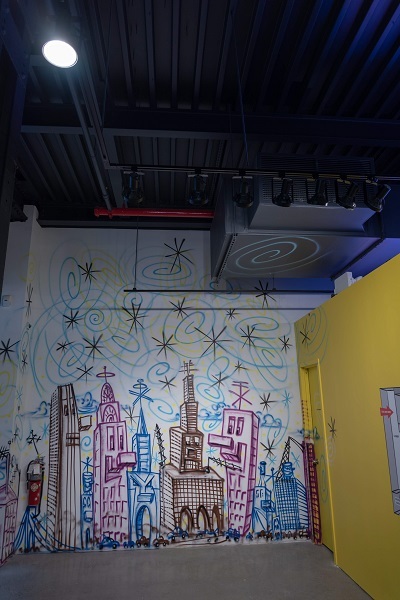 On the far wall, opposite the entrance, is a Kenny Scharf graffiti-style mural of classic New York City buildings with expressive faces. The buildings welcome visitors to the amazing experience that awaits them inside. While waiting in the lobby, don’t miss getting your picture taken with the Mickey and Minnie Mouse ears that are painted on one of the walls. 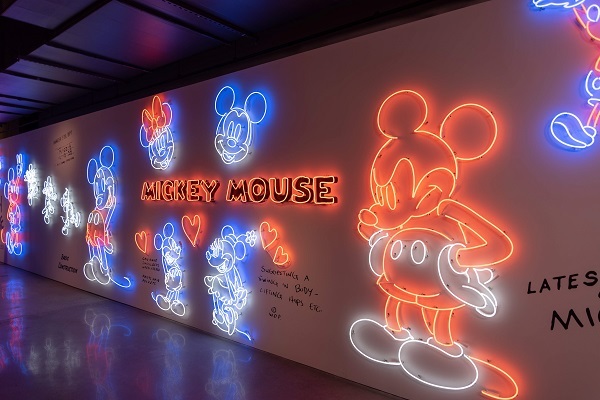 After a brief introduction and video presentation in the Welcome Room, the doors open and unveil a bright neon wall in Hello Mickey! 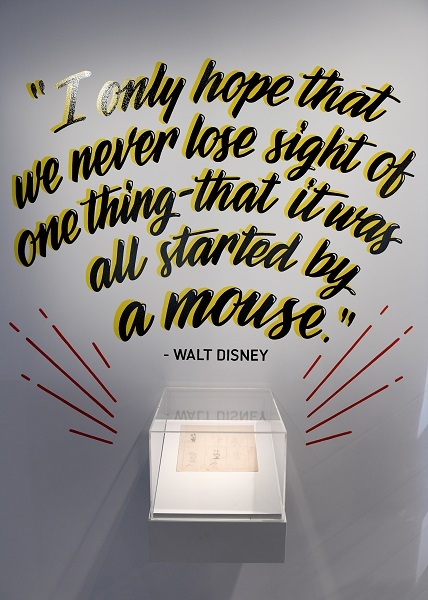 Although the wall of neon Mickeys and Minnies — which runs the length of the room — will grab your attention, be sure to look immediately to your left to see a special Oscar the Academy of Motion Pictures Arts and Sciences gave to Walt in 1932 for the creation of Mickey Mouse. The Hello Mickey! 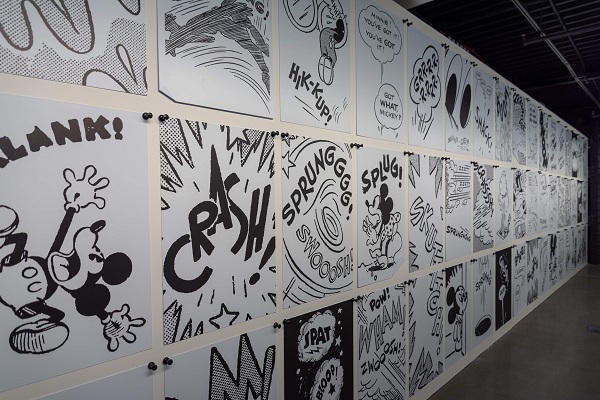 gallery starts off this amazing exhibition with some really fun, interactive takes on Mickey’s early life. The neon Mickeys and Minnies, by Jeff Shelly, are a take on the model sheets that Disney animators did when sketching characters. 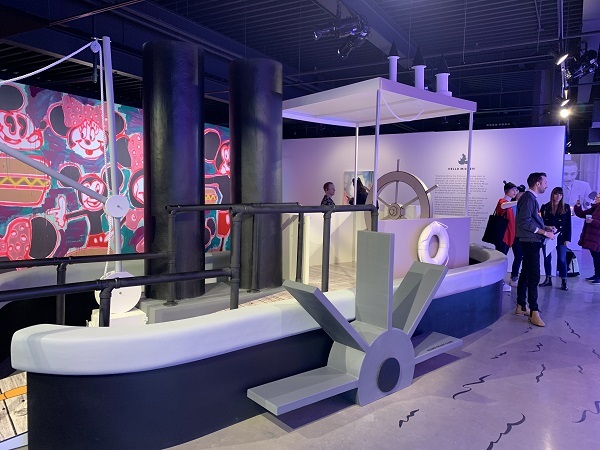 Dominating the room is a massive black and white reproduction of the steamboat from Mickey’s first appearance in “Steamboat Willie” from 1928. Visitors can board the boat and captain the ship for a fun photo-op just like Mickey did. 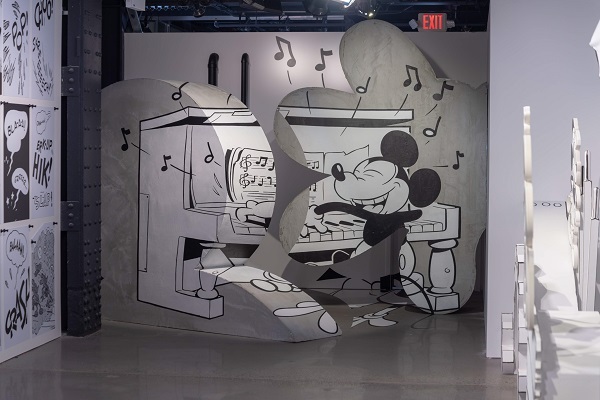 On the wall opposite the neon model sheets is Katherine Bernhardt’s modern interpretive mural of Mickeys, Minnies, and hot dogs honoring the first time Mickey spoke in the 1929 film “The Karnival Kid.” But what should not be missed is tucked away at the opposite end of the room. 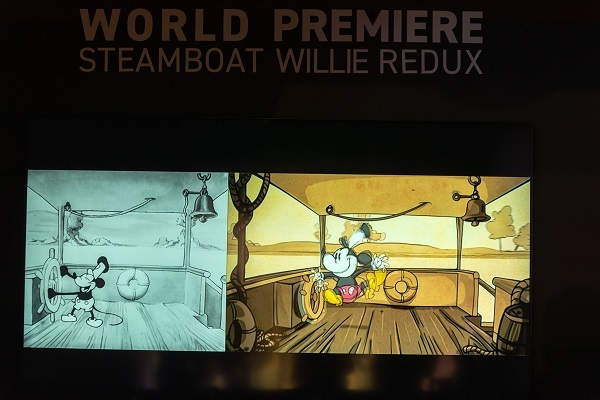 Making its world premiere is “Steamboat Willie Redux,” a reinterpretation of the original cartoon. 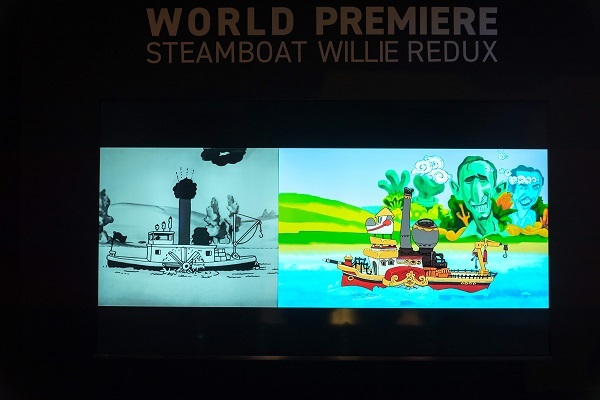 Visitors can watch, side-by-side, a contemporary version of Mickey’s first cartoon imagined by various artists and animators and Walt Disney’s original version. It’s an amazing tribute and hopefully Disney will release this as an extra on a future DVD release. In Oh Boy! 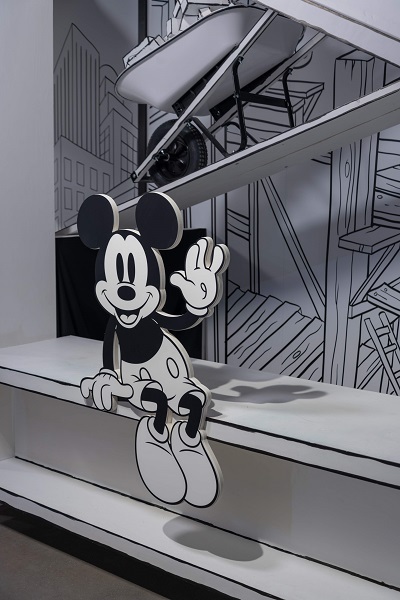 It’s Black & White, visitors step back and into Mickey’s beginnings. 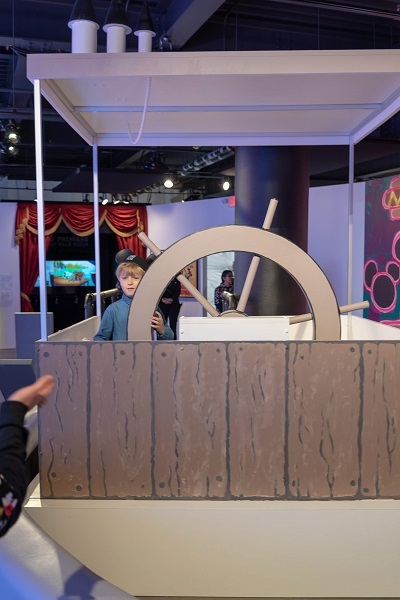 Along with watching clips from “Plane Crazy,” visitors can step into full-size dioramas inspired by the 1933 short, “Building a Building.” Artist Brian Roettinger takes legendary Mickey animator Floyd Gottfredson’s cartoon strips and deconstructs them on a large scale. Transitioning from the world of black and white to color is subtly and masterfully done via a long, narrow hallway in Ink & Paint. 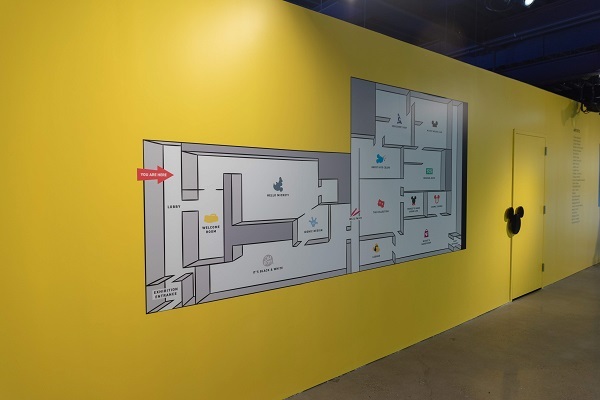 As you enter the room on the right is a modern interpretation of the jars of paint colors that lined the walls at the Disney Animation Studio. Running the length of the room on the right side is an oversized photograph of the actual jars from the Disney Studio. On the left side are photographs of the women who did this arduous work. This room is in tribute to the unsung women who were artists in every sense of the word. They took Mickey from black and white drawings to beautiful Technicolor. 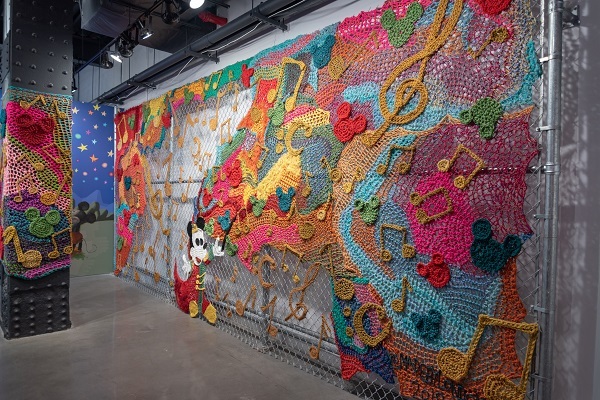 Breaking through into color, Burst Into Color pays homage to Mickey’s first color cartoon, “The Band Concert.” London Kaye has created a floor-to-ceiling crochet art installation from “The Band Concert” that would make any knitter green with envy. 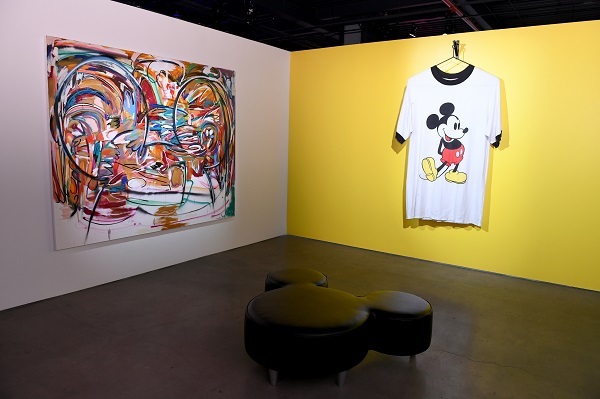 Other pieces that celebrate Mickey’s foray into color include an XXXXXXXXXXXXXXL classic Mickey ringer tee-shirt by Amanda Ross-Ho; looking like an updated Picasso is a colorful, geometric Mickey by Stacey Aoyama; LA-based Michael John Kelly’s bold brushstrokes portray a silhouette of Mickey; and there is a comic strip-like presentation of tablets mounted on an amazing floor-to-ceiling mural depicting Mickey in various stages of his career. A 3-D display of the brooms carrying buckets of water from Fantasia sets up the Sorcerer’s Way. Bathed in blue and purple lights, a large scrim hangs low on the ceiling as pools of more blue and purple lights cascade down to the floor. 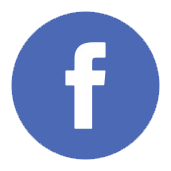 Large images from the animated feature dot the room. As guests look into the wells they will see animation pencil tests from the feature. 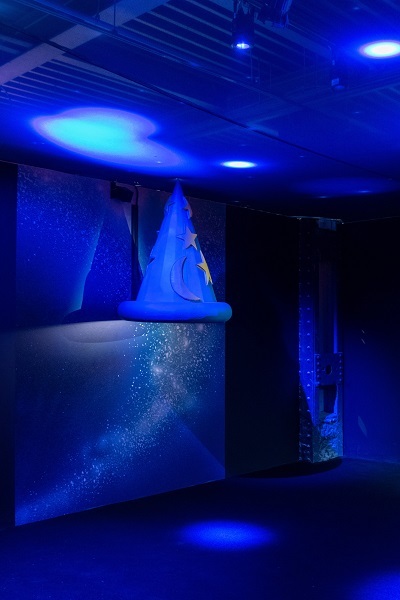 The highlights of the room are the large sorcerer’s hat where visitors can become the sorcerer. 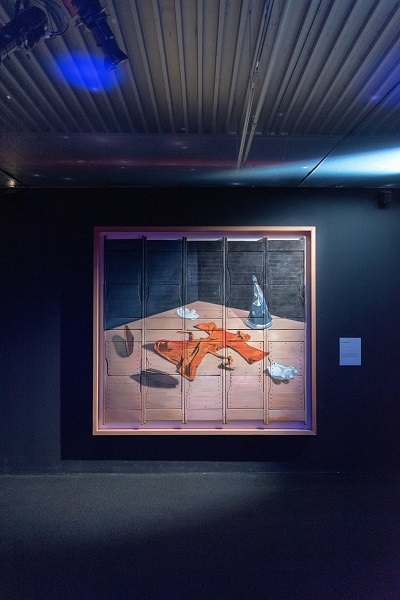 Dominating one wall is Oliver Clegg’s beautiful painting of Mickey’s robe, gloves, shoes, and the sorcerer’s hat lying on the ground. Clegg’s canvas was old Broadway wooden seats. A bright light out of the corner leads guests out of the darkness of the sorcerer’s castle and right into the “Mickey Mouse Club.” Marrying the original MMC with its contemporary cousins, the Disney Archives give guests a rare treat by putting on display Annette Funicello and Cubby O’Brien’s Mouseketeer outfits and their western outfits from Friday’s Talent Round-up Day. 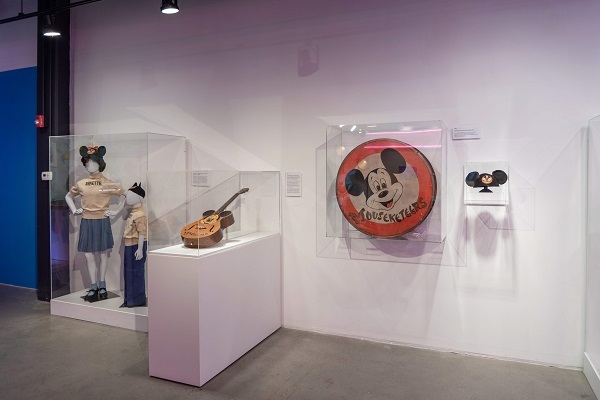 Also on display is Roy’s Mousegetar, a pair of original ears, and a drum. 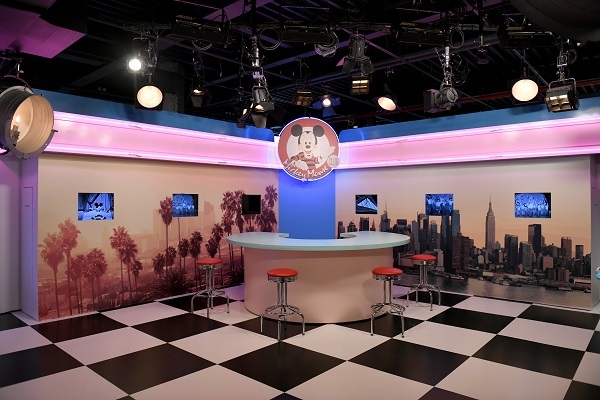 In one corner is a recreation of a diner set up from The All New Mickey Mouse Club with video screens showing clips from the various shows. 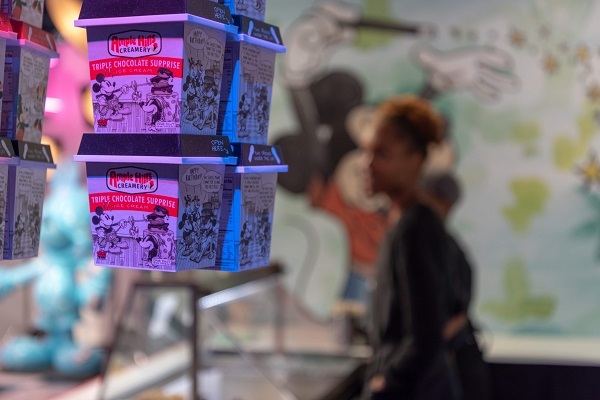 As a special treat, Ample Hills is sampling two out of their three new flavors in honor of Mickey’s birthday — Confetti Celebration and Triple Chocolate Surprise. A third flavor — Peanut Butter Jamboree — is available at their retail location a few blocks away. Although it’s hard to say that there is one piece more beautiful than another, the 1928 Original Muse room may hold those pieces. 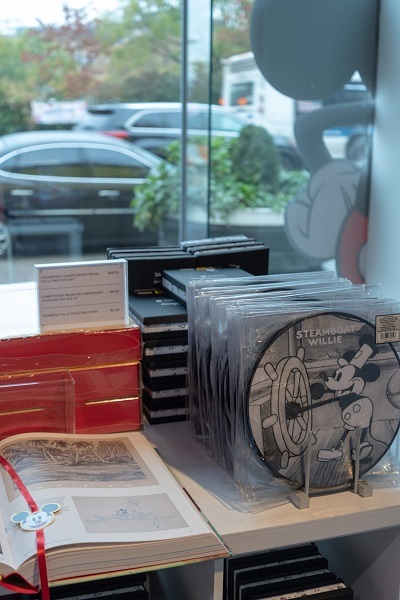 From South Korea is PEACEMINUSONE and his painting of the classic Mickey Disney fans know from millions of pieces of merchandise. It’s a gorgeous work of art. In his interpretation Mickey’s buttons the artist puts his signature peace sign with one side missing. 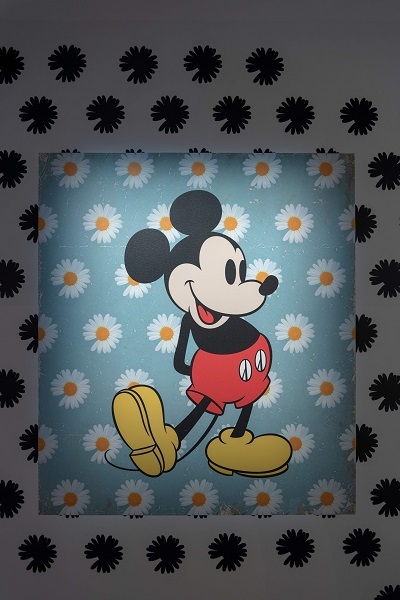 Mickey is placed on a background of daisies with one petal missing. 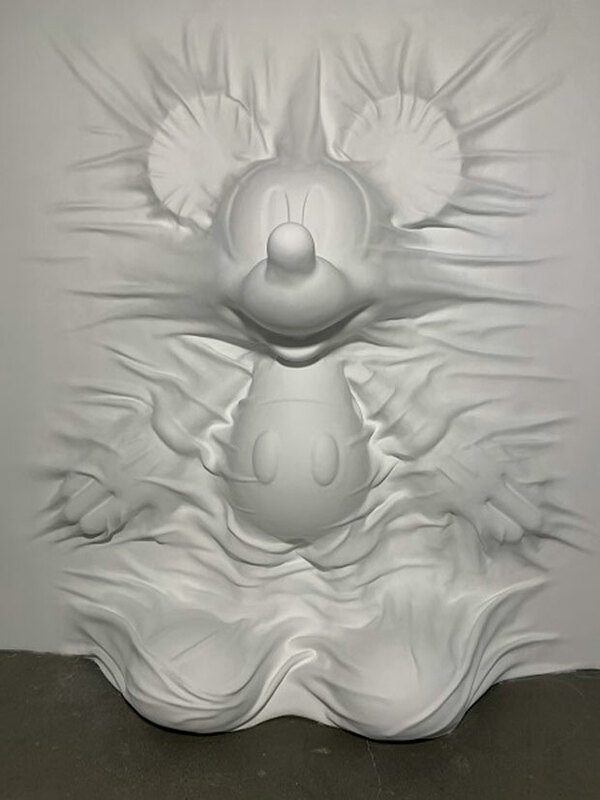 Javier Sanchez-Medina has a fun, yet subtle sculpture of Mickey’s hand when lit from above, casting a long shadow on the wall. 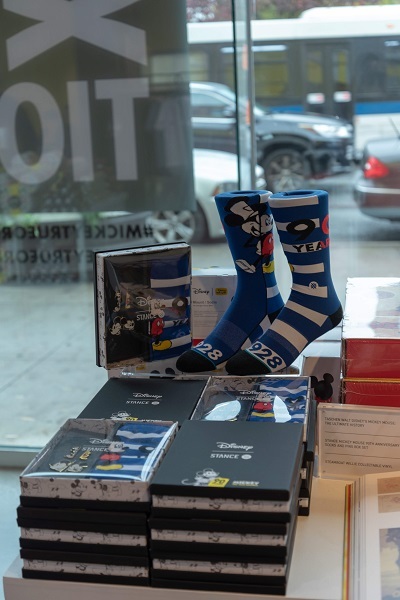 The centerpiece of this gallery is a work by the renowned pop artist, Keith Haring. 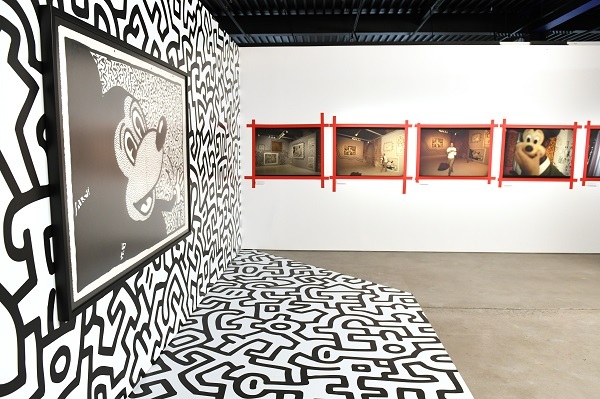 Keith’s acrylic on paper black and white graphic of Mickey from 1981 hangs on a wall of black and white geometric figures that spill onto the floor. 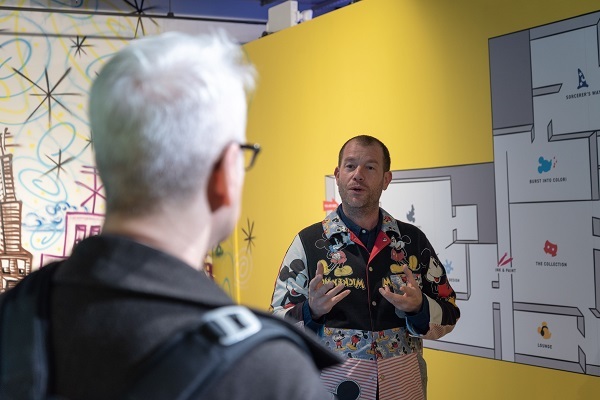 On the wall opposite are a series of photographs taken by Tseng Kwong Chi of Haring with his Mickey painting seen in the background. 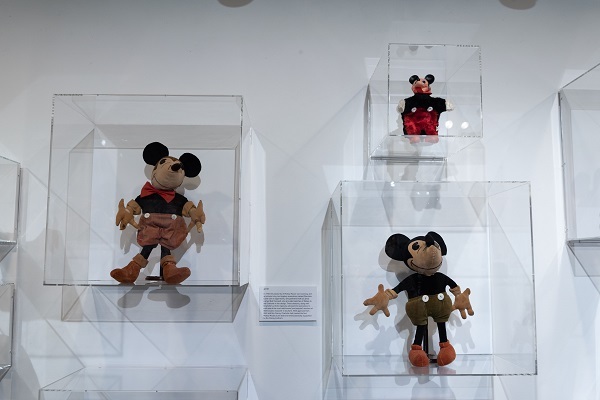 More works of art that fall into the “please Disney sell these” category are photographs and sketches of a beautiful porcelain Mickey and Minnie Mouse. 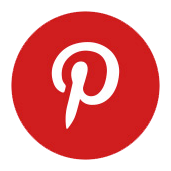 They are designed to look like as if they are a part of a flowering plant. 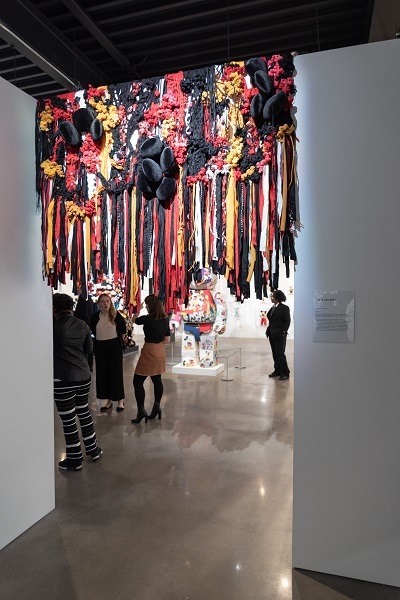 Leading into The Collection gallery and cascading down the doorway is a waterfall of fabric made from plush ears, blankets, and textile by artist Tanya Aguiniga. 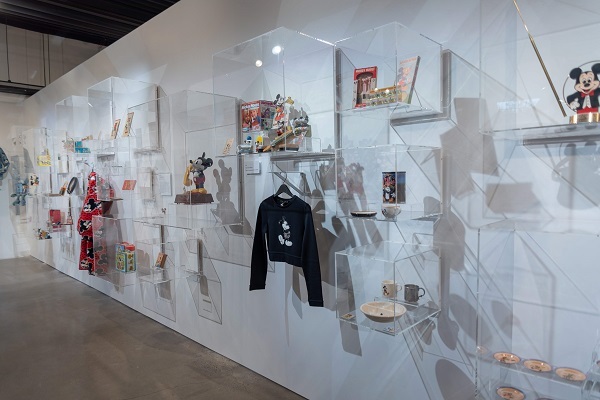 The Collection gallery contains displays of all kinds of Mickey Mouse merchandise — everything from watches and lunchboxes to clothing and the original Mickey plushes made by Charlotte Clark. Dominating the room are two sculptures made entirely of fabric. 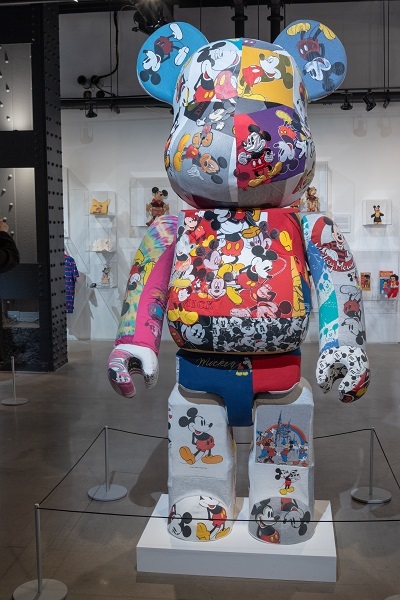 First is the exhibit’s creator, DRx Romanelli’s (Darren Romanelli) 3000% [email protected] wrapped figure of Mickey Mouse made entirely of reconstructed vintage Mickey & Minnie tees and sweatshirts. 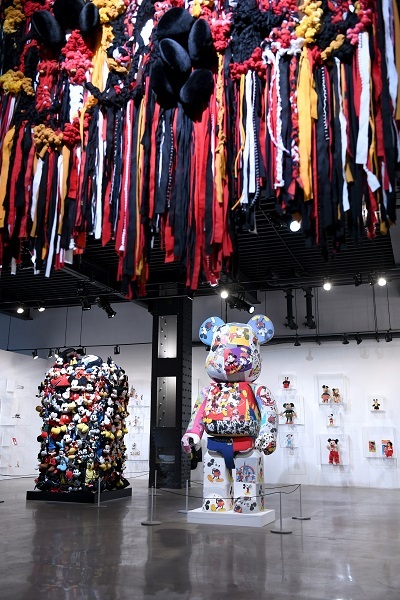 Next to DRx Romanelli’s Mickey is a large bale sculpture made from classic Mickey plush and textiles by artist Shinique Smith. 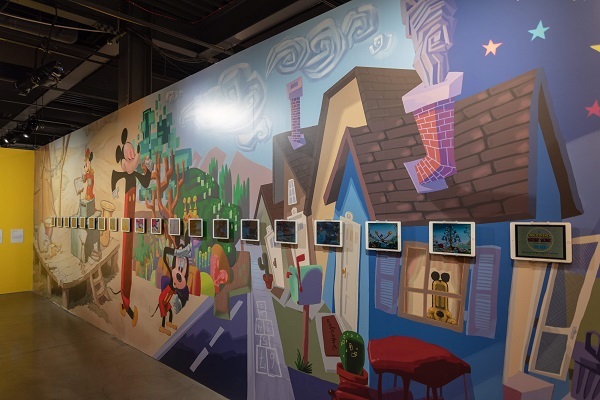 Between The Collection are two galleries that, although fun, are purely commercial — Mickey’s Game Show Live and the Lounge. 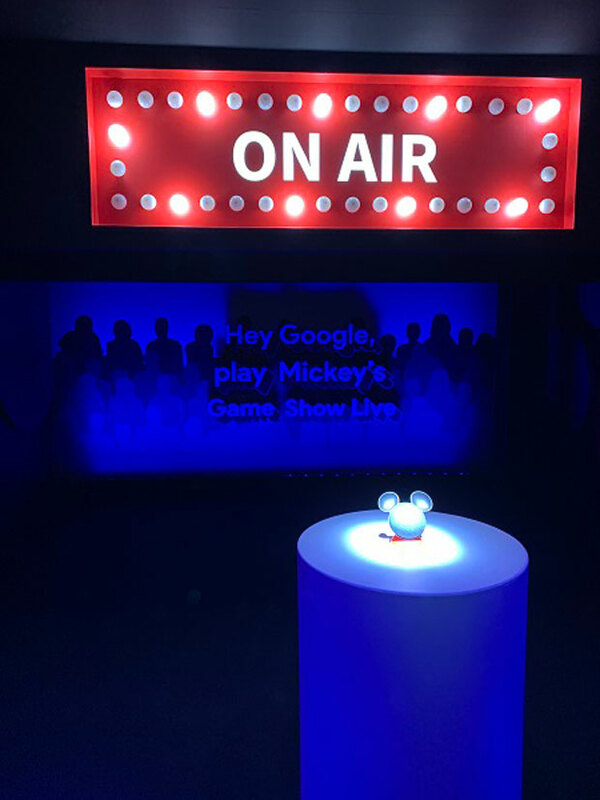 In Mickey’s Game Show Live contestants play from a new trivia game through Google Home. 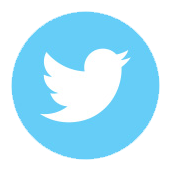 It’s a fun and silly little game, but worth the time. 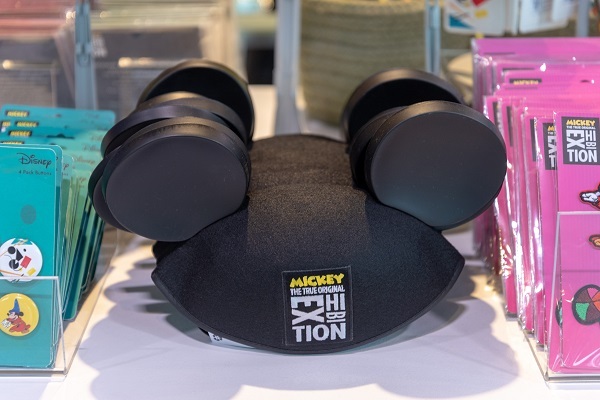 In the Lounge, visitors get to test drive the new Mickey-themed Beats headphones. 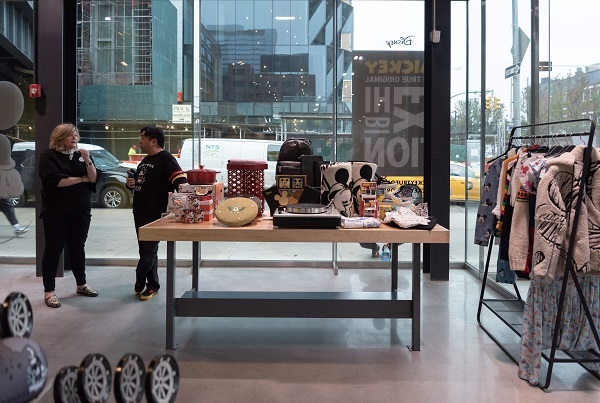 Even though guests will think the exhibits are over once they reach Mickey’s Maker Shop – the gift shop — they’re not. Off to one side in the shop, behind a black curtain, is the final exhibit — “Cosmic Cavern”. 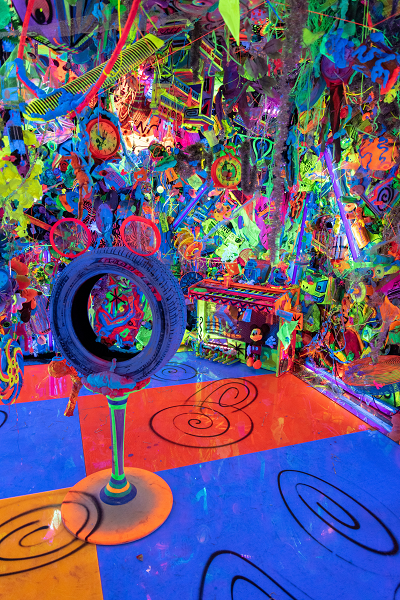 This is by the world-famous psychedelic-painter Kenny Scharf. 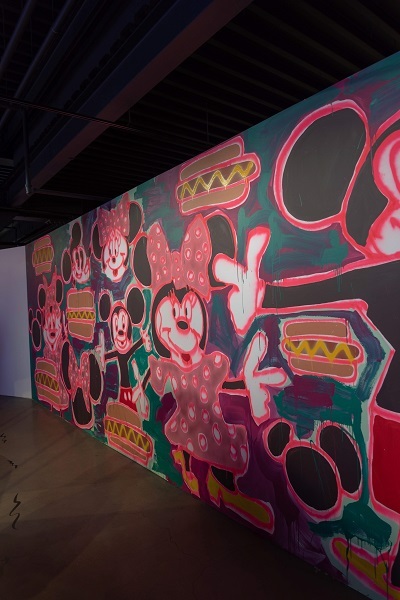 Inspired by the Mickey Mouse wristwatch, every square inch of this room is covered in Mickey tschockies and other everyday objects, but painted in day-glow paint. “Cosmic Cavern” is an overwhelming, sensory-overload exhibit that will make you leave smiling. Mickey’s Maker Shop is a Disney shoppers dream. 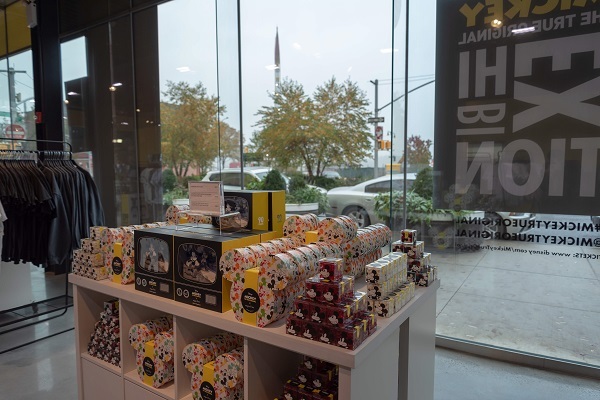 The shop is loaded with all kinds of unique merchandise including a beautiful book, Walt Disney’s Mickey Mouse: The Ultimate History by Taschen, candies and sweets by Sugarfina in exclusive Mickey-themed tins, apparel, pins, hats and more. 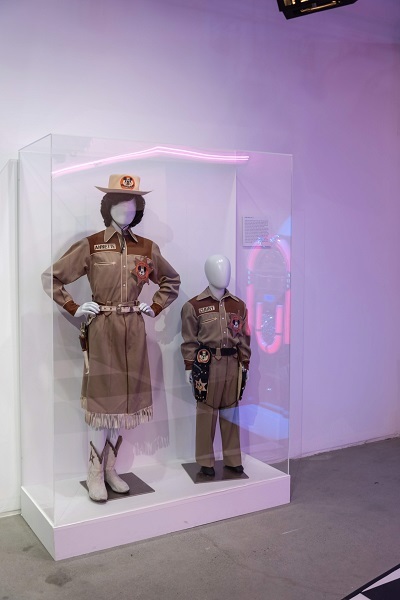 They also have plain tee shirts, sweatshirts and hats that can be personalized with unique patches, as well as Mickey Mouse ears, only available at the exhibition, that can be personalized. I wasn’t sure what to expect from this exhibition. I was a little nervous that the exhibits would be so far out there that they would not be fun or interesting. That was so far from the truth. 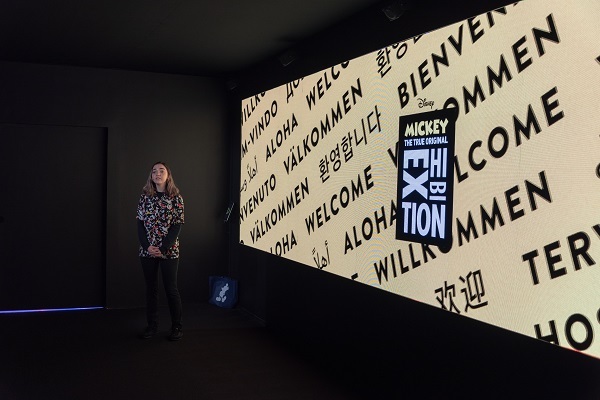 Every exhibit told Mickey’s story in a well-thought-out presentation and the transitions from one gallery to another were seamless. 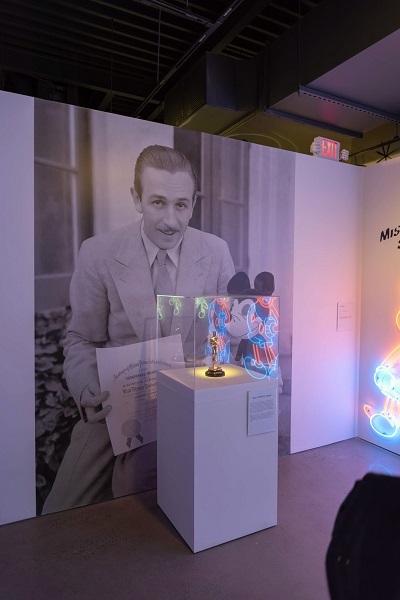 It’s an amazing exhibit that presents this ever-young icon in so many new lights that it will give you a whole new appreciation for the Mouse. 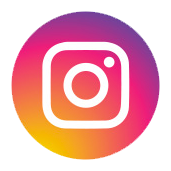 Even though it runs until February, make sure you get your tickets soon because this is a timed-entry exhibit and tickets and times will sell out fast.